Why Don’t You See Dead Birds Laying Around? As you walk around the city or countryside, you might occasionally spot a dead mouse, rat, or squirrel. Driving down the highway, you regularly see road-killed raccoons, opossums, or some other mammal. But how many dead birds have you seen? Maybe an occasional road kill, but that’s all. Why is that? Birds are light in weight, thin skinned, have little fat, are covered with feathers, and have some hollow bones, so they are less dense and weigh a lot less than comparable sized mammals. 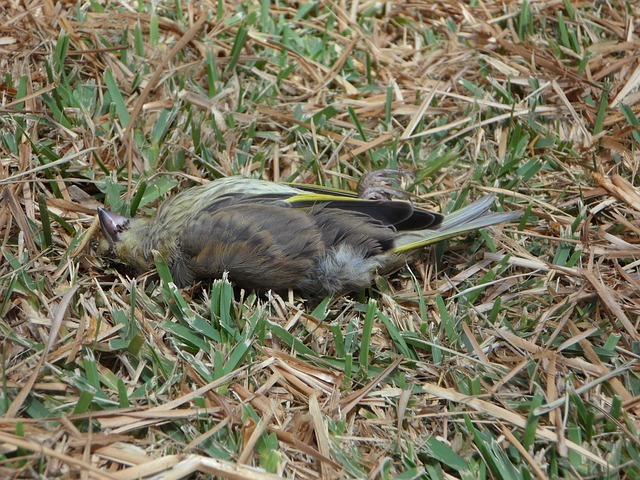 When a dead bird hits the ground, it is almost immediately invaded by small decomposers in the form of bacteria and insects. Vultures and coyotes might also take part in the feast, but the tiny organisms are usually the quickest and most efficient. Being thin and light, a small bird decomposes into an unrecognizable blob in about a day and will disappear in three. A larger bird will take a bit longer, but a small mammal, say a rat, might continue to exist in recognizable form for a week or more. A road-killed hawk or owl will be reduced to nothingness in a few days to a week while a fat, thick-skinned, heavy boned raccoon might lie as a blob on the shoulder of the road for two weeks or more. Birds also float. If they land in a pond, puddle, or lake, they are exposed to the air and the scavengers and decomposers and rarely fossilize, compared to mammals that tend to sink and get covered by sediment. This explains why the fossil record of birds is so poor compared to other vertebrate groups. There is a scientific paper published in 1903 by M. Cline. Now, this is before we knew much about flight, or even feathers. Ms. Cline stated, in all seriousness, that birds are able to fly because they take a deep breath of air, making themselves lighter than air (ok, already the argument loses credibility) and fly off. Her proof is that the piles of feathers you occasionally observe in the field or forest are the remnants of the birds that took too deep a breath and exploded! These feather piles are, of course, the aftermath of a poor bird meeting up with a predator. Raccoons, foxes, or opossums will consume the muscle, but leave the inedible parts – the bones and feathers. The bones are rapidly consumed by rodents who want the calcium and beetles ingest the feathers quickly as they are mostly protein. The only time I have seen a number of dead birds is around bodies of water, after an epidemic of avian cholera hit the waterfowl populations. One of the weirdest things I ever experienced, though, is standing under a juniper tree talking to a colleague, discussing some subject of global importance, no doubt, when a swallow fell from the tree and landed in my outstretched hand, dead. By the way, you can’t get West Nile Virus from handling a dead bird, but it’s still not a good idea to pick one up. This is a question I have pondered and am so glad to have given Google a chance on this. I am an artist working mostly in clay (and some printmaking) and birding images are frequent in my work. I of course have had fanciful explanations always looking for metaphor in nature. Perhaps no less credible than Ms. Cline’s but certainly less violent. I was thinking about this recently because I saw a perfect circle of feathers but no body in one part of my garden as if a whirling dervish of a bird had spun off its feathers. It’s grey feathers looked like a mourning dove. The on the same day a tiny bird with yellow and grey feathers on my back steps. It sat there for days. Surprising because of the numbers of scavengers and predators that abound. In any case your explanation is as rich metaphorically as any. I thank you for your post. And if you have an idea as to why the little bird was still there – barely with any evidence of decomposition days later please speculate. It is February but we have had both 80 degrees one day and a low of 25 just a few nights later. For some reason many people think my last name is yours though it is an entire syllable shorter! I find it staggering to pose a question I’ve been pondering ever since I saw a little dead Bunting 15 years ago, wondering why I had never seen a dead songbird before and having one who KNOWS respond to my query within days…THANK YOU!!! Where can i find a copy of the scientific paper published in 1903 by M. Cline? Sounds like an interesting read! When I get a chance I will scan it for you. Could I also have a copy of the Cline article? That sounds like a great read! Thanks in advance. I recently brought a tropical plant I keep outside for the summer back into the house approximately 2 weeks ago when temperatures started to drop in the evening to around 0 degrees Celsius. This evening, I noticed that some of the leaves on one side of the plant were dying. I thought it was frost bite, so I cut off the dead leaves, finding it odd that it was only on one side of the plant, but perhaps it was on the most unprotected side. When I went to inspect closer, to my surprise, I found a dead bird at the base of the plant. My husband thought it was a warbler. He removed it (with gloves) and said it had already started to decompose. He mentioned that about one month ago there was a bird that was hanging out for days in our front porch. He noticed the bird flying off then returning over and over again. The bird seemed annoyed that my husband was there. He thinks the bird was likely sick, weak or tired, and decided to take refuge in our potted plant and eventually died there. Is this possible? Have you ever heard of this?? Well, I have never heard of this particular situation, but birds have to die somewhere and this one chose your plant.